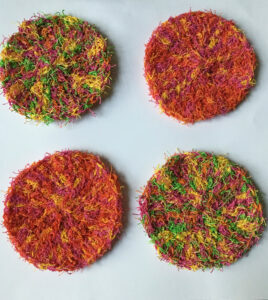 Tutti fruity, these retro crochet coasters will add a splash of colour to your decor. And, they are the perfect project for last minute gifts as they work up super quick. I made five in an hour. Maybe less. I’m not sure exactly, but they were done before I knew it, and my boyfriend is still marvelling over how fast I worked these up. 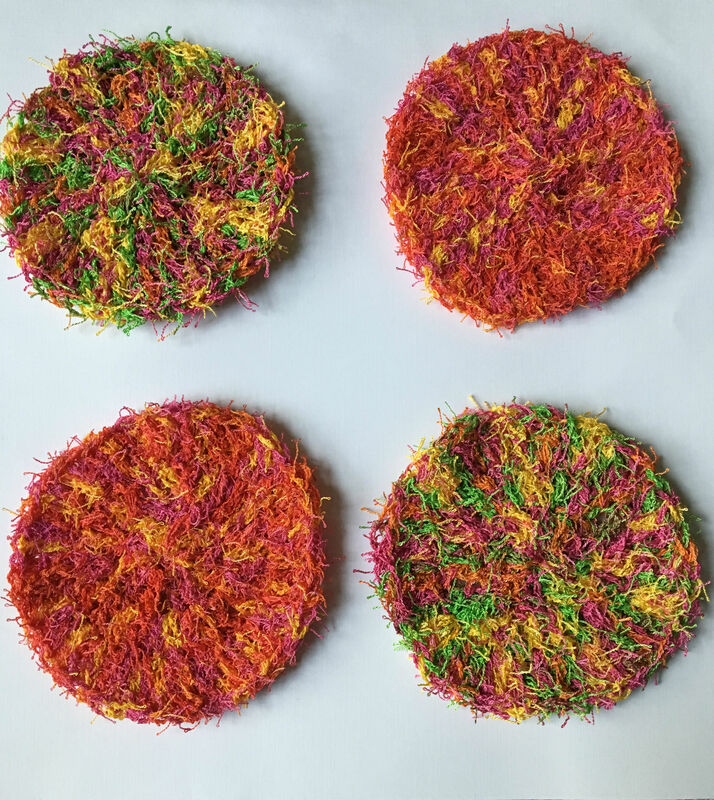 Made from Red Heart Scrubby yarn, these are so easy to make that I would recommend this even to someone new to crocheting in the round. There are simple rounds and the size works out perfectly to fit under your mug of coffee or glass of wine. They look great under both too 😉 I never thought I’d use Red Heart Scrubby yarn because of the texture but I am delighted with how these turned out. And to my surprise, this yarn never caught on my hook once or tangled once, so bonus! To make these coasters, I had planned on following the pattern on the label, and I did but I stopped at round three because it was already big enough. I also wanted something simple since the colours and texture pops so much already. I totally love my retro crochet coasters! 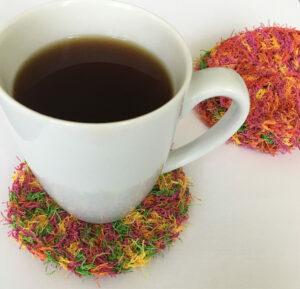 To make the retro coasters, you’ll need a 5.50mm (I size) hook and one skein each of Red Heart Scrubby Yarn in Zesty and Tropical. There are other fun choices as well so have fun playing with this yarn! I still have plenty of left over yarn, so you could make a ton of these. You could also add round four from the back of the label to add a bit of frill to your piece. Coasters aren’t your thing? You could use this yarn to make scrubbies, naturally. I imagine this yarn would exfoliate your skin nicely with your favourite bar of scented soap. Try this lovely pattern by Red Heart for a handy little scrubby. Or, try this dishcloth beautiful pattern by Little Monkeys Crochet. So many possibilities!